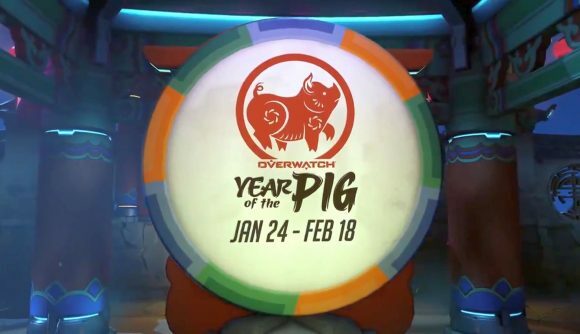 Overwatch’s Lunar New Year event will, unsurprisingly, return in 2019. In line with the Chinese Zodiac this year, it will be called Year of the Pig, and will run from January 24 to February 18. The Overwatch Twitter account broke the news last night – the tweet shows Soldier: 76 doing a drumroll with a Bolang gu, a handheld toy pellet drum, in what’s likely to be one of many new emotes the event will add. Given that it’s the Year of the Pig, expect Road Hog to get one of the new Legendary skins (Overwatch League teams are replying to the tweet with Road Hog emotes to stoke the hype). Speaking of which, Blizzard promises to show one of those new skins each day on its Twitter and Facebook, so keep an eye on social media if you’re interested. Nothing else has been officially confirmed yet, but both previous Lunar New Year events have featured a Capture The Flag mode, so we’ll probably see that return – Year of the Dog added a new Thailand map specifically for CTF, in fact. Assuming Blizzard follows its established pattern, Lunar New Year will be followed by the Archives event some time in April, when a new PvE mission is likely to give us another glimpse into Overwatch’s history. The two such events so far have been some of Overwatch’s best-received, and there are already people looking forward to it in the replies to yesterday’s tweet. Ana’s Bastet challenge is still live in Overwatch until January 21 – click here for more details, though there isn’t a lot to it, really. You just have to win games across any mode to unlock a new set of cosmetics, with a gorgeous new Ana skin coming at nine wins.